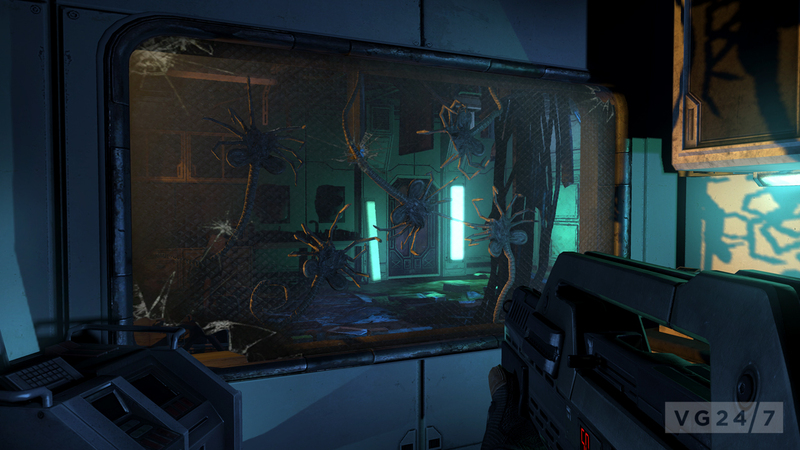 Aliens: Colonial Marines is clearly a labour of love. Crafted, according to Gearbox, with the intention of being the Aliens “sequel we all wanted”, the game is dripping with fan service. First announced in late 2006 after Sega acquired the Aliens license. Went quiet in mid 2008 and was rumoured to have suffered lay off-releated delays. Surfaced again at PAX 2010, with marketing winding up early 2011. It’s a far cry from the Aliens vs. Predator games that SEGA have put out in the past, intended to be more loyal to the source material than any other game. “The predominant idea is that we really wanted to make the sequel to Aliens that we all wanted,” Brian Martel, chief creative officer at developer Gearbox Software tells VG247 after our demo. With dreadlocked baddies firmly out of the picture, Colonial Marines seems poised to be a scarier, edgier experience than past Aliens titles. We see marines, including the playable character, waking up amongst rubble. “Are you alright?” one character asks the player. “How many fingers am I holding up?” It’s three, but the response is a one-fingered gesture. “He’s fine,” the squad leader says, ignoring the gesture – and then he’s up, the player in control. The marines skulk through the ruins of a building lit now only by dim, red emergency lighting. “What the hell is that?” One marine remarks at a strange, small alien creature – familiar to those who have seen the movies – that ominously floats in a giant test tube. Further into the building, rain pours inside through a gigantic hole in the wall. But that’s not all that’s wrong. Up comes the motion tracker, a major visual hallmark of the Aliens world. Bad news – it’s bleeping. Tense music pulses and the beeping quickens as more and more red dots representing doom appear on the tracker, actually in the marine’s hand in game as opposed to a mere HUD element. Suddenly, aliens burst from air vents – they’re smaller than the ones from the movies but also fast. The marines shoot and shoot, but some are dragged to their doom. There’s screaming, shouting. One alien leaps onto the player, who is tasked with fighting it off with button presses. This first person action is fairly key to the style of Colonial Marines, the choice to keep the camera angle locked to the eyes of the marine a deliberate one on Gearbox’s part. The aliens we see are seemingly smaller and more agile than the ones I remember from the movies, but that’s soon remedied – outside the building a huge, hulking alien ambushes the squad. Running to a building, the squad closes the shutters before the alien can get in. It crashes against the barrier loudly and then slinks away – and you can even watch it do so on the motion tracker. The audio mix on that crash seems impressive in the small room we’re in, surround sound in full effect, and the visuals stand up very well too – the rain looks cool as it pours into the ruined building, and the aliens look sufficiently slimy and disgusting. The visual design, ripped right from the movies, is still as awesome-looking as it was in the 80’s. Adding new things to that universe is difficult for Gearbox; though movie rights owners Fox are on hand to help out with ensuring that everything fits the vision of the Aliens universe. “It’s very different than something like LucasArts where there’s one person who is kind of the keeper of all things, but we’ve been able to work with Fox very heavily,” Martel elaborated. 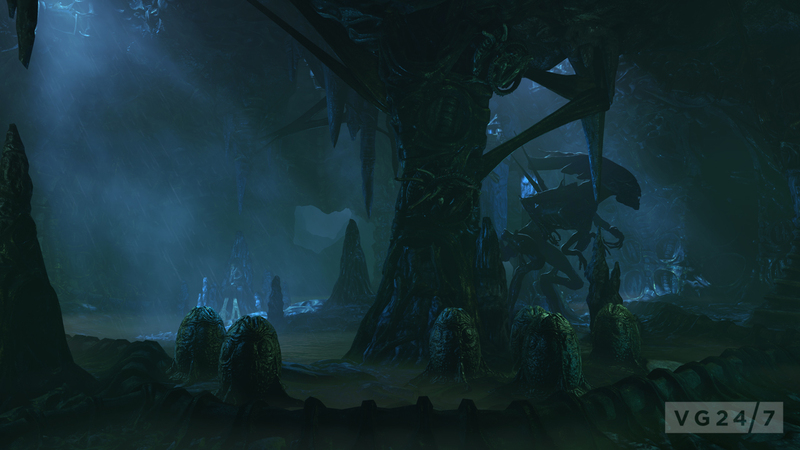 Aliens Colonial Marines E3 2011 teaser. From the gamescom demo, that attitude appears to pay off – the demo we saw was varied. Starting off with a crashing ship, it transitioned to a slower, quiet section as the marines carefully worked their way through the building. From there it all pops off in a big way and goes badly wrong for the marines. In a mission that started with a stealth focus, the marines now have to pick up automated turrets and place them in bottlenecks to rip aliens to shreds. 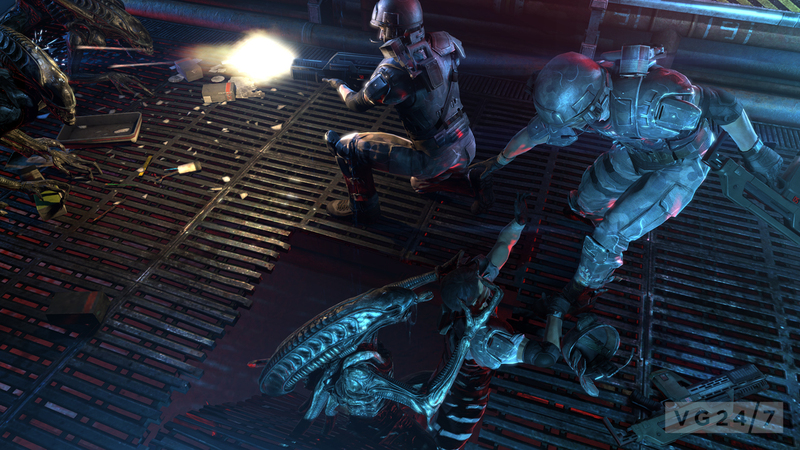 Marines are picked off one by one as aliens burst from air vents and drag them off – the sense of desperation from the marines is palpable in the animations, the voice acting and the scripting. As if things weren’t bad enough, out go the lights. 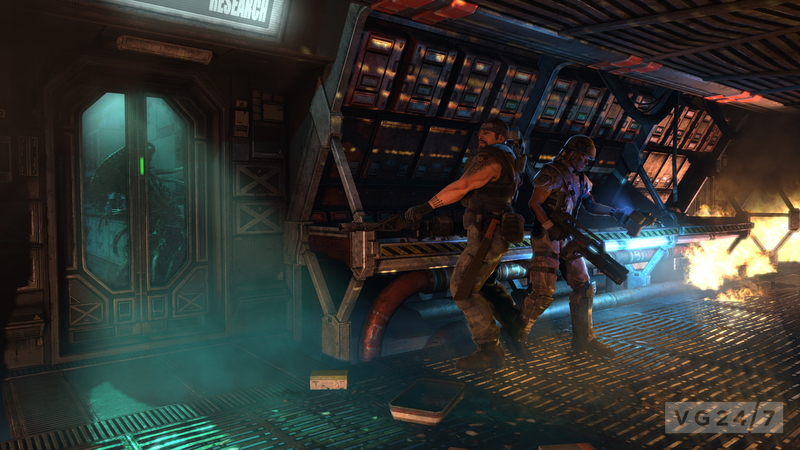 The Gearbox rep playing pulls up the motion sensor and uses it to avoid and fight aliens until he reaches another lit area – through all of this, the marines are trying to beat a desperate retreat, but the game keeps switching gears between firefights, running and suspense-packed moments. The demo ends on an even grander note, with a bunch of marines facing off against a ridiculously massive enemy creature. One marine is controlling and fighting in the big yellow mech from the end of the movie – and it’s swatted aside by this new, tank-like alien with ease. That big alien’s advancing on the player – closer, closer – it picks him up – and the demo ends. We’ll have to wait until Aliens: Colonial Marines launches to find out what happens and wait until we can go hands-on before we pass judgement on the gameplay, but this much is certain from what was on show at gamescom: it looks cool as hell. 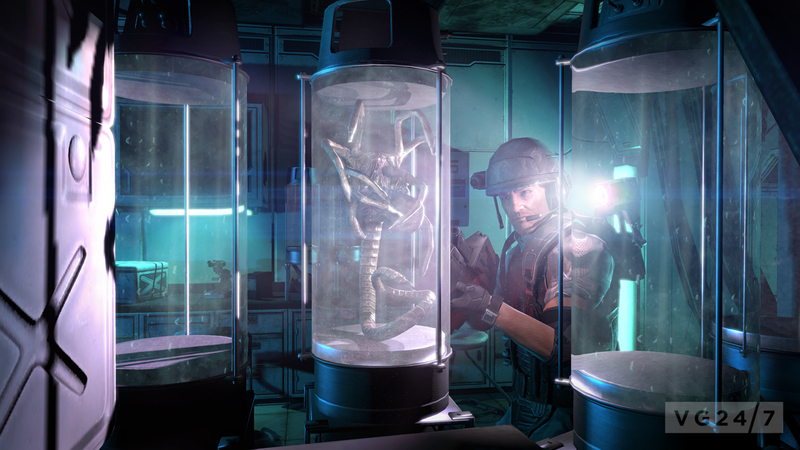 Aliens: Colonial Marines launches in spring 2012 for PS3, 360 and PC.